Fair Trade Father's Day Gifts | All That's Fair. Well, you know if we do a Mother’s Day post we have to do one for the dads too! Father’s Day is June 15, and we have some great ideas if you’re still searching for that perfect present. We’re sure Dad will love a fair trade Father’s Day gift! 1. Personalized Wood Cutting Board: handcrafted in the US from harvested cherry or maple wood, this beautiful piece will be a welcome addition in the kitchen! 2. Paulino Bud Vase: Add some modern flair to Dad’s office with this intricate bud vase, which supports a family’s pottery business in Nicaragua. 3. Recycled Cork Coaster Set: Nothing like a man in a ‘stache! The recycled wine cork program that makes these coasters keeps thousands of corks from ending up in landfills across America. 4. Seven Hopes United Classic e-Gift Card: Always a good choice! Let him pick out his own gift and enjoy knowing that whatever he chooses will help support the worldwide fair trade mission. 5. Laughing Hippo Cork Wine Stopper: If he’s a wine lover, you’ve gotta go with this one. Who doesn’t love a laughing hippo? Whether your dad enjoys whipping up a feast in the kitchen, toasting the fam with a newly popped bottle of wine, or just has a passion for sustainable and ethical shopping, I’m sure you’ll find something wonderful for him at Seven Hopes United! 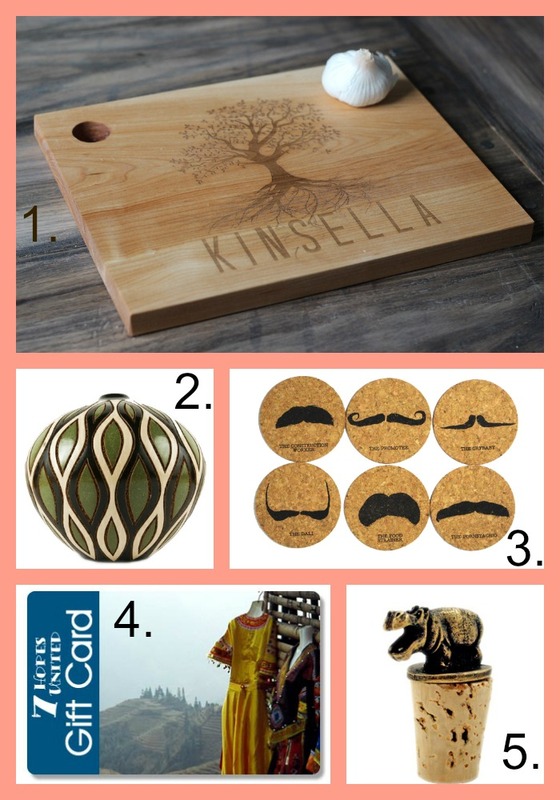 This entry was posted in General, Gift Guides and tagged Fair Trade Father's Day gifts on May 30, 2014 by Casey Trogden.